This is really my favorite painting so far! 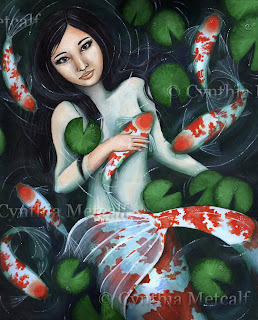 A beautiful koi mermaid swimming with her koi friends. It is a 16 x 20 stretched canvas and is READY TO HANG! I love watching koi, they are so peaceful and bring tranquility to me. I wanted to capture their beauty in this piece! Click on the link to it on the left column to check it out! This is awesome!!! I love this painting! Thank you! It is one of my FAVORITES!!! I haven't had much time at all to paint so my art shop may be taking a slightly different direction for a little while until I can breathe a bit. I'm not giving up painting: just taking a vacation from it. wow what beautiful and awesome !!!! all you painting is great I love it.